Cambodia's opposition party escalated its challenge to the country's election results Wednesday, claiming it had actually won a majority of National Assembly seats. The action suggests that the opposition is digging in for a protracted battle over the results against the long-time Prime Minister Hun Sen.
Hun Sen meanwhile made his first public appearance since Sunday's election, speaking briefly at the opening of a flyover bridge in the capital. He struck a conciliatory tone, saying that he would send two of his close party colleagues to hold talks with the opposition leaders. He did not otherwise commit to any course of action. Yim Sovann, spokesman for the opposition Cambodia National Rescue Party, said that based on reports from party workers and election observers, his party had won at least 63 of the assembly's 123 seats. 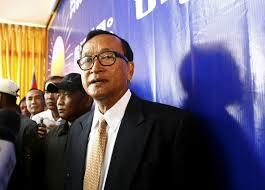 Party leader Sam Rainsy made a similar claim late Tuesday to a small group of reporters. 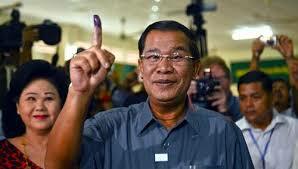 Hun Sen's Cambodian People's Party earlier claimed it had won 68 seats to the opposition's 55 in the election. Provisional official results support the ruling party's projection. The opposition has already called for an investigation of voting irregularities, including registration problems that could have disenfranchised more than a million people. There have also been accounts of people voting who were not entitled to. Hun Sen said Wednesday that he would support establishing such a body if the state National Election Committee approved it. The government-appointed body, criticized for failing to address registration problems before the election, has not appeared inclined to endorse such an action. 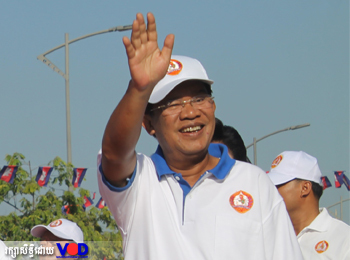 Hun Sen said he did not wish the people to be upset by the conduct of the election. His appearance came after rumors had circulated earlier that he had resigned or fled the country. The opposition's complaints have been supported by a number of nonpartisan Cambodian and foreign groups. The U.S.-based group Human Rights Watch charged Wednesday that the ruling party "appears to have been involved in electoral fraud in Cambodia's July 28, 2013 national elections, according to residents and ruling party officials" it interviewed. "Senior ruling party officials appear to have been involved in issuing fake election documents and fraudulently registering voters in multiple provinces," Brad Adams, the group's Asia director, said in a statement. "And people from the party seem to have been turning up in places where they clearly don't live and insisting on voting — not to mention the many other claims of fraud around the country." Mr. Hun Sen visits a bridge construction site at Stung Meanchey on Wednesday 31st July, three days after the election. (Reuters) - Cambodia's long-serving leader, Hun Sen, said on Wednesday his party was ready to talk to the opposition after both sides claimed victory in Sunday's general election, talking of the need for compromise but calling himself "prime minister elect". "We open our heart to compromise in order to create a parliamentary leadership," Hun Sen said while on an inspection of a bridge construction site, his first public appearance since the election and his first comments on the deadlock. "We have to respect the people's decision and if we don't, and turn to violence ... that would lead to chaos in the whole country and this is not what people want to see," he said. The election campaign and voting on Sunday were largely peaceful but Phnom Penh remains tense because of the political stand-off. Police and the military are maintaining a presence on the streets, although business is mostly back to normal. Hun Sen, 60, has been prime minister for 28 years and has crushed dissent in the past while maintaining tight control through his Cambodian People's Party (CPP) and a network of business, government and military allies. Earlier on Wednesday, the opposition Cambodia National Rescue Party (CNRP), said it had won the general election, stepping up its battle with Hun Sen's CPP, which has also claimed victory and rejected accusations of electoral fraud. Yim Sovann, a lawmaker and spokesman for the CNRP, said it had won 63 seats in the 123-member parliament, with the CPP getting 60. "This is according to figures of votes we collected from various provinces and this needs to be investigated," he told Reuters. Professor Greg Barton from Monash University discusses a very tight outcome in Cambodia's election, and the country's continuing transition to a democratic system. Days after Cambodia's government claimed victory in its bid for reelection, opposition leader Sam Rainsy expressed dissatisfaction with what he described as the "disenfranchisement of a large portion of the electorate" in the country's recent election. Rainsy, president of the Cambodia National Rescue Party, told HuffPost Live on Tuesday that the CNRP saw huge gains in the vote, nearly doubling its presence in parliament by claiming 55 seats. The Cambodian People's Party and Prime Minister Hun Sen won 68 seats out of 123, a fall from the 90 it formerly controlled. The CNRP claims that the CPP distorted election results through voter fraud, removing names from electoral rolls and limiting the opposition's access to the public by tightly controlling media. Sam Rainsy's assessment of the situation is simple: "Outgoing Prime Minister Hun Sen is afraid of me and he does not want to have a fight with me." When host Ahmed Shibab-Eldin asked why Hun Sen might fear the opposition, Rainsy replied that the winds of change in Cambodia are in the CNRP's favor. "I am the only real challenger to him, and my party has enjoyed growing popular support while his party, a former communist party that has been in power for 30 years, has now encountered more and more popular resistance," Rainsy said. "Because of human rights abuses, people are more and more unhappy with the ruling party." Prime Minister Hun Sen said this afternoon he would “welcome” an international investigation into the contested results of Sunday’s election. The remarks, his first public comments since the election, came after opposition leader Sam Rainsy announced the party had done far better than the preliminary government results had suggested and called for the premier to step down. “For the sake of free and fair elections, I welcome the international community, all political parties and the NEC to investigate this,” he told reporters, while speaking to workers at the construction site of a flyover in Stung Meanchey. The opposition Cambodia National Rescue Party has called for a joint committee made up of representatives of all parties and international monitors to review the results of Sunday’s election, which gave the ruling Cambodian People’s Party 68 seats to the CNRP’s 55. The government had previously shot down such a proposal. Opposition lawmaker Son Chhay said yesterday the premier's endorsement of such an investigation was a good step but that the CNRP were not interested in negotiating with the CPP until the probe had been completed. Change in the air as Cambodia votes? Cambodia's opposition party says it narrowly won Sunday's general election, challenging the ruling party's earlier declaration of victory. Hours after the poll, PM Hun Sen's ruling party said it won 68 seats in parliament to the opposition's 55. Hun Sen has been in power in Cambodia for nearly three decades. The national election commission is widely expected to back his Cambodian People's Party (CPP), says the BBC's Jonah Fisher in Bangkok. 'Instability' Sam Rainsy told the BBC that the opposition would not take its seats in parliament - expected to sit in September - until its win was recognised, which would prevent a new cabinet being approved. "We expect the CPP to concede the election to us. The information we have received from the our activists and party agents show that we have won 63 seats and they have won 60," he said. "To move forward without an independent committee is cheating. We will comply with the conclusions of an independent committee. There is no other way or else the county will face a period of instability and uncertainty." Ouch Borith, Cambodia's secretary of state at the Foreign Affairs Ministry, on Tuesday rejected claims of voting irregularities. "We have over 10,000 national observers and over 100 international observers who reckoned our election was held in a peaceful manner without any violence, free and fair," he said. Sam Rainsy claimed the CNRP won at least 63 of the total 123 seats. The opposition Cambodia National Rescue Party (CNRP) issued Tuesday night its own results from Sunday’s national election, claiming a razor thin victory over Prime Minister Hun Sen’s ruling CPP and calling on the country’s long-time leader to stand down. CNRP president Sam Rainsy claimed that his party won at least 63 of the Assembly’s 123 seats, eight more parliamentary positions than the CPP said the opposition had won, according to their preliminary results, which they issued on Sunday evening. Cambodia was in a state of political paralysis tonight, as the country’s opposition leader Sam Rainsy claimed victory in disputed elections that appeared to show support for the incumbent – Prime Minister Hun Sen – had plummeted. With Sunday’s election results still unofficial amid claims of widespread fraud, the opposition Cambodia National Rescue Party said that it had won at least 63 seats and the ruling party had won no more than 60. The government – which also declared victory and said it would push ahead towards establishing a Cabinet – was forced to deny rumours that Prime Minister Hun Sen had fled the country after 28 years in power amid the controversy. “This is psychological warfare that ill-intentioned people always fabricate in order to poison the social atmosphere,” the government said in a statement. Following Sunday’s poll, the ruling Cambodia People’s Party (CPP) claimed it had won 68 seats – 22 less than in 2008 elections – against 55 for the opposition. 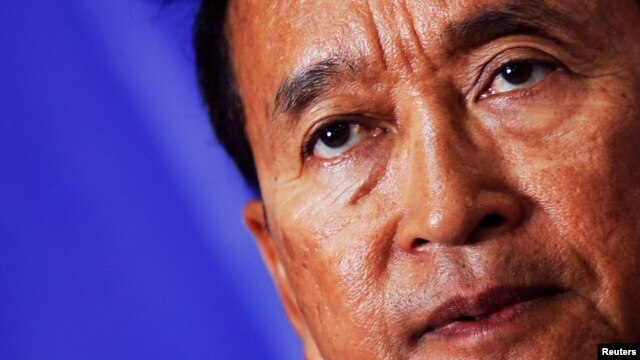 Mr Rainsy’s party has threatened to rally its supporters to stage countrywide protests if the government does not set up a joint investigation to look into accusations of election fraud, a solution backed by the United States and the European Union. 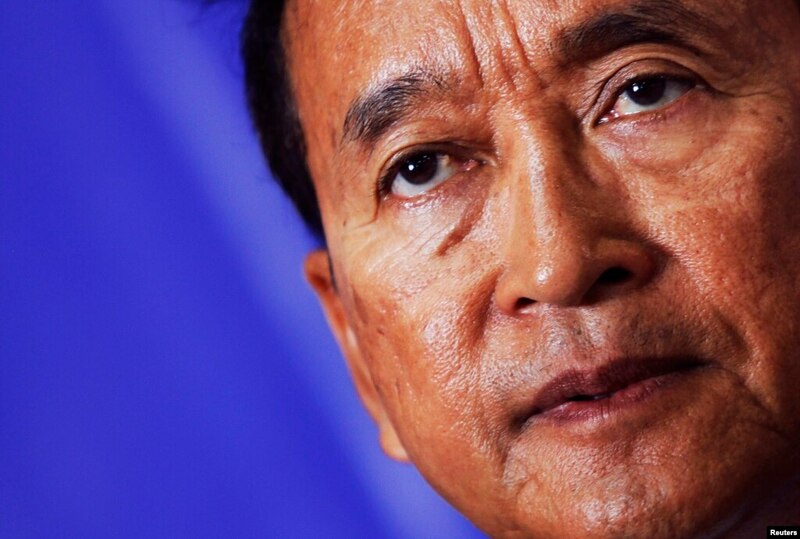 “There is a democratic change in the air in Cambodia,” said Mr Rainsy. Feeling the need to respond to rumours that Prime Minister Hun Sen had abandoned his position and fled the country in the wake of huge losses at the national election, the Cambodian People’s Party issued a statement assuring everyone that the enduring leader was carrying out his role as usual. Staying silent after an election is not unusual for Hun Sen – it took the prime minister 10 days to speak publicly after the 2008 ballot – but digital hearsay was enough for the CPP’s Central Committee to want to set the record straight. The CPP also made it clear that Hun Sen – who went four days without speaking publicly after the commune elections last year – would be continuing as prime minister for the next five years. This followed online rumours that Interior Minister Sar Kheng would be assuming the role, with Hun Sen falling on his sword for failing to win the 60 per cent of the popular vote he had promised. [Another rumour said Sok an will take over]. Hun Sen broke his silence after the CPP’s commune elections victory last year to mock the opposition parties’ plans for a merger that led to the forming of the Cambodia National Rescue Party. If a joint committee investigates the irregularities and results from Sunday’s election, it will discover the opposition has won between 80 and 90 seats in the 123-seat National Assembly, Cambodia National Rescue Party president Sam Rainsy (pictured) said today. Rainsy told the Post that his party’s final figures from the poll, which do not factor in irregularities, showed the CNRP had secured 63 seats – enough to lead the country – but an investigation would put that figure much higher. “[Sixty-three] is our figure ... our final result,” he said. “But I want to specify that ... if we re-adjust this figure for irregularities, disenfranchised voters and ghost voters, we would have won a much a larger estimate. He went on to add that the figure could actually be as high as 90 seats. Because of this, Rainsy said, Prime Minister Hun Sen should offer his resignation because “the figures are against him”. In a press conference Monday, Rainsy and CNRP deputy leader Kem Sokha rejected the government’s call of a 68-55 Cambodian People’s Party victory, claiming irregularities had cost them victory. Sam Rainsy, president of the Cambodia National Rescue Party, addressing reporters at party headquarters, Phnom Penh, July 29, 2013. Cambodia’s opposition party will meet with its supporters Wednesday to gather evidence of election irregularities, following major apparent gains in elections Sunday. Sam Rainsy, leader of the Cambodian National Rescue Party, says his party is now seeking evidence to bolster its claims for national and international observers. “This is to show to the national and international observers to be able to see clearly that there are many victims who lost their voting rights. They wanted to vote but were not able to do so because their names were stolen or left out in a trick to prevent majority of the Cambodian people from voting." Rainsy told VOA's Khmer service on Monday that as many as 1.2 million voter names had been removed from the national registry, while 200,000 names on it were duplicates. Reuters reports that Ouch Borith, secretary of state at the Foreign Affairs Ministry, has rejected calls for an international inquiry and called on the opposition to clearly show what evidence it has. The ruling Cambodian People's Party of Prime Minister Hun Sen has said it won a majority of 68 seats in the election, a major decline from the 90 seats it hold in the outgoing parliament. On Tuesday, the party said it would maintain Hun Sen as Prime Minister. The U.S. and EU have both expressed concern over voting alleged irregularities in Sunday's vote. The U.S. has called for a "transparent and full investigation of all credible reports of irregularities." Meanwhile, EU foreign policy chief Catherine Ashton notes the NEC did not take all measures recommended by the EU to address "shortcomings" in the election process, "such as improving the reliability of the voter list, ensuring equitable access to media and preventing the use of State resources, including campaigning by civil servants and the military." Jen Psaki, the U.S State Department spokeswoman. The US Department of State on Monday called on Cambodian authorities to carry out a full investigation into “all credible reports” of election malfeasance, saying that it was “concerned” by various issues taking place both on, and leading up to, last Sunday’s vote. At a press briefing in Washington, State Department spokesperson Jen Psaki praised Cambodians “for their active and peaceful participation” in the elections, before going on to call for an examination of defects in the electoral process and an investigation of irregularities – a move that comes just after the opposition and civil society made their own such calls on Monday. Psaki went on to say that the State Department would be “closely monitoring” information distributed by the National Election Committee, and emphasised that any investigation must be “viewed as credible by the Cambodian people”. Though the Cambodia National Rescue Party and civil society organisations have called for an independent investigating body comprised of all stakeholders, Sean McIntosh, a spokesman for the US Embassy in Phnom Penh, said that “ideally, it would be the NEC” that conducted the investigation. However, McIntosh added that the embassy was “talking to civil society to gather their thoughts as well, and ... amassing information”. Chhoeum Bun Chung, CNRP’s working group chief to Varin said the letter was found while the Commune Election Committee was counting ballots on Sunday afternoon. “It states that the higher-ranking soldiers are colluding and selling the soldiers’ rice and canned fish rations, causing a lack of food for the soldiers to eat. Whoever currently has the letter, please pass it on to Hun Sen,” Pheuy said adding that volunteer students who measured the land for the soldiers are also to blame for the corruption. Rong Chhun intervenes after a voter was denied a right to vote despite having voting IDs លោកពូ រុងឈុន សុំការបកស្រាយពី គជប លេខ 0828. Despite making impressive gains, Cambodia's opposition leader rejected the results of a general election won by the long-time ruling party. Political analyst Manfred Hornung examines the impact of the recent poll. Provisional results from the vote on July 28th showed the opposition capturing 55 of the 123 seats in the National Assembly and Prime Minister Hun Sen's Cambodian People's Party winning 68 seats - a majority of 55 percent. Opposition leader Sam Rainsy, who returned from exile last week to campaign for his Cambodia National Rescue Party but wasn't allowed to run, called for an independent investigation into allegations that as many as a million people may have been deprived of their right to vote. 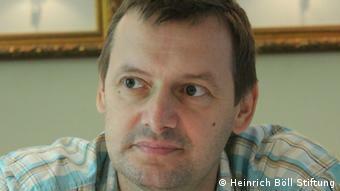 Political analyst Manfred Hornung, who enlisted with the Cambodian non-governmental organization NICFEC to monitor the elections, said in a DW interview the poll was marred by a series of institutional and political irregularities. DW: What were the key issues in this election? Manfred Hornung: The key issues that marked this election and drove thousands of people to participate in the pre-election street campaigns revolved around the pervasive corruption in the country, widespread land-grabbing, the lack of formal employment aggravated by low wages, and the denial of basic political freedoms. In the pre-election phase, the youth also expressed growing frustration in social media at the partisan election campaign coverage by state-owned television and radio stations, which clearly favored the positions of the ruling Cambodian People's Party (CPP). The preliminary election results show a considerable increase in popular support for the opposition movement. The Cambodia National Rescue Party (CNRP) is said to have secured 55 seats of a total of 123 seats in the National Assembly. During the last legislature, the opposition had a combined 29 seats in the House. Some 50 people in Kampong Cham province’s Tbong Khmum district were summoned to a pagoda on Monday morning to receive their promised pay-offs for votes they cast for the ruling party in the previous day’s election – but only after swearing an oath before the pagoda spirit that they actually did. Runn Sophea, the deputy district governor in Tbong Khmum, confirmed the payments to the Post yesterday, while denying that villagers had been made to swear an oath. According to local villagers, all of whom asked not to be named for fear of reprisal, village chiefs and their subordinates had passed out money that had been handed down from higher levels of the party leadership, with 10,000 riel [$2.50] going to each villager who swore the oath and 20,000 riel [$5] going to the chiefs themselves for organising the vote. Another villager who said he was called to claim the money, said the oath-taking ceremony was meant to identify Cambodia National Rescue Party supporters. “In the law, it says the election is secret, but how secret is it?” he asked, adding that oaths were taken to find out “exactly who voted for the CNRP in order to easily watch them”. 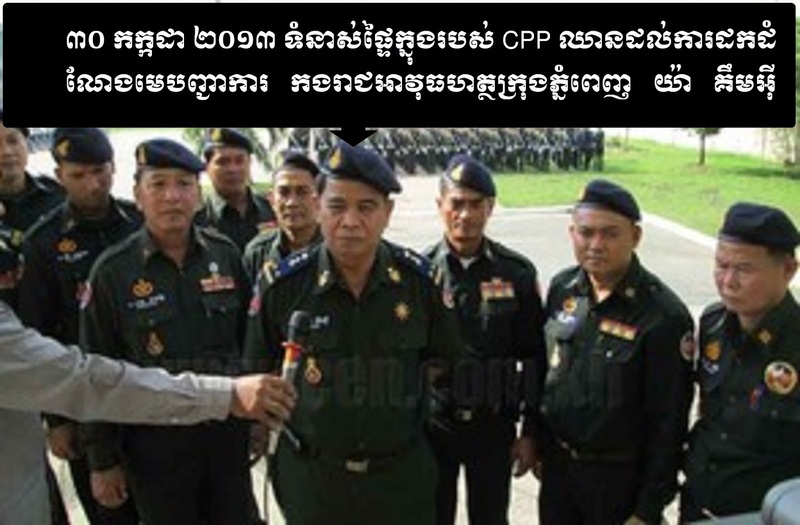 Deputy district governor Sophea, a Cambodian People’s Party appointee, denied any such conspiracy. “Giving money is just to encourage them because they voted for the CPP, and after the election, Peam Chilaing commune was won by the CPP,” he said. PHNOM PENH (AFP) -- Cambodia's opposition leader has threatened to call a nationwide protest against the hotly disputed election victory of Hun Sen's ruling party, unless the result of last weekend's poll is reversed. 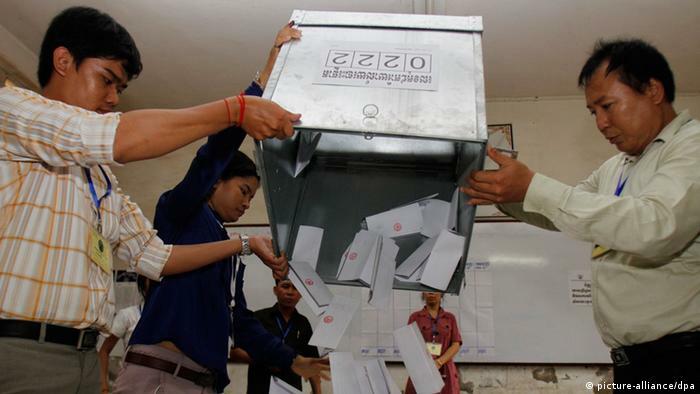 The opposition Cambodia National Rescue Party (CNRP) has rejected the results of the closely fought poll that returned the ruling party to power, alleging it was robbed of victory by widespread voting irregularities. "The results are not true," Sam Rainsy told supporters in a video posted online late Monday. "In fact, the CNRP has won the election... Everybody knows this, even the CPP knows that the CNRP is the winner," Rainsy said. "If they do not accept our victory, we will hold nationwide demonstration," he added, urging CNRP supporters to spread the protest threat across social media. The CNRP has already called for a UN-backed probe into allegations that 1.25 million legitimate voters were culled from the electoral roll, while more than one million "ghost names" and a further 200,000 duplicated names were added to the list. (New York, July 31, 2013) – The ruling Cambodian People's Party (CPP) appears to have been involved in electoral fraud in Cambodia's July 28, 2013 national elections, according to residents and ruling party officials interviewed by Human Rights Watch. All allegations of election fraud and other irregularities, including bias in the election machinery, should be promptly investigated by an independent commission. The CPP-controlled National Election Commission (NEC) released preliminary results showing that the ruling party won 68 seats and the opposition Cambodian National Reconciliation Party (CNRP) won 55. Based on the same results, the CPP won approximately 49 percent of the national vote, while the CNRP won approximately 44 percent. The opposition has claimed widespread fraud and called for the creation of an independent expert body that includes the United Nations and nongovernmental groups to examine the results and address irregularities. "Senior ruling party officials appear to have been involved in issuing fake election documents and fraudulently registering voters in multiple provinces," said Brad Adams, Asia director at Human Rights Watch. "And people from the party seem to have been turning up in places where they clearly don't live and insisting on voting – not to mention the many other claims of fraud around the country." A CPP village chief, who asked for anonymity to protect his security, gave Human Rights Watch an insider's account of how ruling party authorities in his district engaged in electoral fraud by issuing fraudulent "Identity Certificates for Elections" (ICE) before the July 28 elections. The certificates allow people whose names appear on voter registration lists to vote even though they otherwise lack proper identification documents. After a long month of excited but still fearful election campaign, an unofficial result has produced a very sad and disappointed news for Khmer inside and outside the country. The incumbent CPP which has ruled the country over 30 years with systematic network of intimidation and corruption still won the election. while the newly formed Cambodia National Rescue Party (CNPR) lost to a narrow margin. Most people has confidence that if this election was held in a free and fair atmosphere, the CNPR would win with landslide. In a long calm and curious election day, people took in a long line to cast their ballots in hope of a great change will happen in the upcoming day. But in the late evening day, the CPP proclaimed their election victory with 68 seats to 55 seats for the opposition the CNRP. Many opposition supporters broke into tear in disbelief when an unofficial result was heard. This election result has reflected the massive fraud throughout the country such as deletion the name of the voters, double names, ghost list, the movement of Vietnamese, military, and government officials to vote in different places, and vote buying by the CPP. For example, in Phnom Penh many people did not find their names at the polling stations and protested with the election officials and turned against the police who intervened by burning down two police vehicles. Those people accused the authorities of helping Vietnamese to vote while they are Khmer did not have name to vote, about 1.2 million voters were unable to vote. In opposite, there are about 200,000 duplicate names. This is a painful situation for all Khmer in the country. However, in many polling stations, people lost their faith with authority and took the matter into their own hands by preventing the Vietnamese from voting. In Battambang, the opposition helped to prevent many truckloads of Vietnamese from voting. this is part of a systematic networks set up by the ruling party to cheat the vote. In the other story of fraud, people lined up to get money from the CPP's officials after they voted for them. Numerous election frauds by the CPP were witnessed by youtubes, facebook and the other media around the world. As the systematic election frauds have been practised in the past as well as the current one by the CPP, we must learn from this bitter lesson and demand a serous inquiry into this matter in order to prevent it from happening again in the future. To win the election with dignity, Prime Minister Hun Sen must play a fair game with his opponents otherwise all his election victory will be meaningless and greeted with protest rather than congratulation notes that used to be received by many new elected leaders around the world. Unconfirmed - The majority of the government officials of the former Hun Sen regime are ready to join the CNRP already!!! This news come at a time when there are rumours that there are internal conflict within the ruling CPP, that Hun Sen has left the country and that he has resigned prime minister. The Communist Pirate Party (CPP) !!! The United States voiced concern on Monday about reports of irregularities in Cambodia's weekend elections and called for a credible investigation. "We urge all parties and their supporters to continue to act in an orderly and peaceful manner in the post-election period," State Department spokeswoman Jen Psaki said. The Cambodian opposition rejected the results of the polls even though it made significant gains, saying it had been robbed of victory over strongman Premier Hun Sen.
"We are concerned by numerous reported irregularities in the electoral process," Psaki said, adding that Washington had long called on Phnom Penh "to address systemic flaws such as problems in the voter registry and unequal access to the media." "We call for a transparent and full investigation of all credible reports of irregularities," Psaki told reporters. It was the worst election result for Cambodia's ruling party since 1998, after the opposition was emboldened by the return from exile of its leader Sam Rainsy, even though he was barred from running. Hun Sen's Cambodian People's Party (CPP) announced late Sunday it had taken an estimated 68 out of the 123 seats in the lower house, against an increased 55 for the Cambodia National Rescue Party (CNRP). Is this a sign of cracks inside the ruling CPP? Hun Many, Sar Sokha, Say Sam El, Dy Vichea, Dith Tina, Sok Sokan, Kim Rithy, Cheam Chansophoan: This was the dynasty that was meant to shake up the party; young men groomed by their powerful fathers to step in and bring a message of change. Instead, every one of the eight scions listed on the ballot lost. As the ruling Cambodian People’s Party regroups in the wake of Sunday’s election and considers the future, it would be wise to hone rather than abandon this new focus on youth, analysts said yesterday. In many ways, these young, first-time candidates appeared to have been set up to fail. None were given a position higher than four on the list, while half of the group were listed as reserves. Contrast that to the four provincial governors, all of them well into their 60s, who retired from their positions earlier this year. Listed no lower than third on the candidate rolls, three of them won seats. “It’s a very aged government to begin with,” pointed out political scientist Carlyle Thayer, emeritus professor at the Australian Defence Force Academy. “New blood,” he said, could be highly beneficial to changing the ruling party’s way of thinking. Indeed, the group shows promise. They are highly educated, both here and abroad, and already hold impressive government positions. Many, 31, Prime Minister Hun Sen’s youngest son, holds degrees from top universities in the US and Australia. Sar Sokha, 34, the son of Interior Minister Sar Kheng, is Phnom Penh’s deputy police chief and studied abroad. So too did two-star general Dy Vichea, 32, who is the son-in-law of Hun Sen and son of the late, notorious National Police Chief Hok Lundy. Whether it is through dynasties or through new members, the long-ruling party stands in need of young blood, but injecting that into the party is no easy task. A victim of its own system, the CPP’s highly entrenched patronage networks have stymied development. For two decades, as the party has sought to tighten and cut down on factionalism, it has become ever more reliant on a handful of top leaders and their associates. Such a system has made flexibility, up to the current moment, all but impossible. But the preliminary results of Sunday’s election suggest the networks may be beginning to crumble. It’s a reality the party may be considering how to address. Kong Heang, former governor of Kampong Speu, told the Post yesterday that Many would almost certainly wind up with a seat – that of Senate First Vice-President Say Chhum, who won the first lawmaker position in the province. “Say Chhum will step down in order to continue to work at the Senate,” he said. តាមការផ្តល់បទសម្ភាសន៏ របស់លោកស្រី មូរ សុខហួរ កាលពីយប់ថៃ្ងទី 29-07-13 បានឲ្យដឹងថានៅខេត្តបាត់ដំបង គឺ គណបក្សសង្រ្គោះជាអ្នកឈ្នះ...!!! What caused the Stung Meanchey riot? Citing huge polling irregularities, the opposition yesterday rejected the government’s claims the ruling party had won the National Assembly election 68 seats to 55, amid suggestions the opposition had gained nearly as much of the popular vote as its rival. At a press conference at the Cambodia National Rescue Party office in Meanchey district, party president Sam Rainsy and his deputy, Kem Sokha, claimed ghost voters and names missing from the list had cost them victory at Sunday’s election and called for a joint committee to be established to investigate. “The CNRP does not recognise the result announced by the ruling CPP or the very similar NEC results,” Rainsy said. “That’s why we require a technical working group comprising the CNRP, the CPP, the UN, the NEC and local and international NGOs to investigate and make a report about these irregularities,” he continued, adding this must happen by August 31. Sokha said he believed that last figure was roughly the difference between the two parties. The result, announced by Information Minister Khieu Kanharith on Sunday night, marks a huge victory for the nascent CNRP – which was formed last year by a merger of the two opposition parties – and catapults it to a position of political power unseen by an opposition party in a decade. Although official information from the NEC remained elusive and difficult to follow yesterday, everything pointed to a genuine two-horse race. Transparency International released findings yesterday saying the CPP secured 48.5 per cent of the popular vote and the CNRP 44.4. With margin for error, those figures could be 46.8 per cent and 46.2 per cent respectively, TI says. Tallies compiled by other observers, based on an NEC broadcast on TVK yesterday, have the CNRP ahead.